At the center of the Fire Wand Circus bigtop floats a fresh impetus for the inhabitants's endevors. An eternal flame of passion and will crackles around a star come down to ignite fervor in their hearts. A magic wand, indeed, it emboldens them to seize it's potential. The club reminds them to find a practical application for this burst of new energy and to bring it down to earth. Graham's booklet says: "This card symbolizes the purest form of energy as fire surrounds a wand. Fire is an element that gives us inspiration, warmth and heat. We feel a great sense of creativity around us; we are being guided towards original thinking and new projects. There is an emphasis on individuality. Divinitory Meaning: The Ace of Wands represents a great form of action. Reverse Meaning: Lack of energy, stagnation." I’ve had this deck for a long time but only started really looking at it today after reading some of the posts in this study group. I always had a kind of mental block when trying to distinguish between the wands and pentacles suit. I was intrigued by your post and pulled out this card. It led me to light bulb moment so thank you. By looking at the wands suit as magic wands I finally ‘got’ the idea of creative energy once and for all! Funny how simple things can elude us for the longest of times. Whenever I see the ace of wands/rods I will now think of being handed a magic wand – it sums up the card in my mind. The Ace of Wands depicts a large wand surrounded by flames – it looks like it’s bursting with life. It all looks very vibrant and energetic. The colours are warm and bright, and just looking at it makes me want to get into action . I definitely needed the Ace of Wands’ energy, because it was a very busy day, with a lot of stuff going on. It was a long day too, because I already got up at 7.30 am (really early considering it’s the summer holidays). I felt pretty tired towards the end of the day, but it was the good kind of tired – you know, being tired because you realize a lot happened and the day was a success. 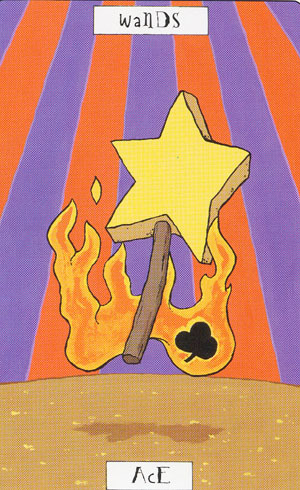 I just noticed that the flames don’t burn the wood of the wand on the card – do you think this could be a way of telling that it’s important not to get burnt and not to scatter your energy? The card makes me feel warm inside, and I’ve tried to pass that warmth on to others. It was my mom’s birthday, so my brother and me got up early and brought her breakfast in bed. In the evening, I made dinner and we gave her our presents. The Ace of Wands feels kind of like a celebration, so it’s very fitting (the Wands’ court cards even look like they have party hats on). The wand’s top is shaped like a star. I associate stars with hope, desires and wishes. They inspire us, and they light our way when everything else seems dark. The scene is located in a circus tent, and the stripes in the background look like rays coming from heaven. Circuses make me think of creativity and originality, and I reckon you can meet some very interesting individuals there . Seems to be a wishing wand to me. And linked with the circus, it seems to be even more magical! It was a good idea/inspiration to put both together, in the same suit!